Government Boys’ Primary School (GBPS) Mangria, is 22 kilometers away from Larkana, the district headquarters. A majority of the community is illiterate and their livelihoods depend on agriculture, livestock and daily wage labor. 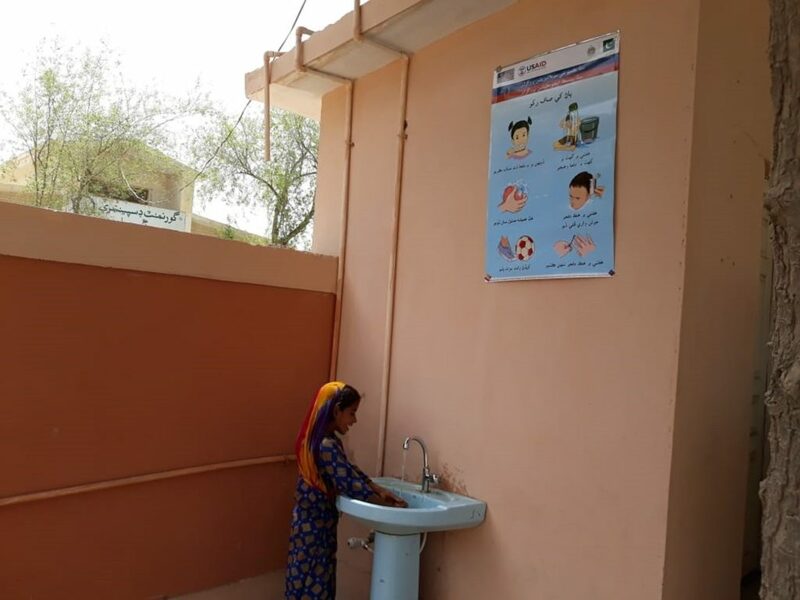 Prior to the interventions of the Sindh Community Mobilization Program (CMP) under the USAID-funded Sindh Basic Education Program (SBEP), the school was lacking many basic facilities like toilets, drinking water and electricity. The situation was a hindering factor for students’ attendance and dropout, especially for girls. CMP included GBPS Mangria as one of its 27 neighboring/non-construction schools in Larkana district and began community mobilization interventions to improve the situation there. The CMP team worked to train School Management Committee (SMC) members, raised awareness of nutrition, health and hygiene for students, teachers and community members, and held gender mainstreaming sessions to nurture a more inclusive environment for girls and women. CMP also provided small grants for provision of furniture, installation of solar panels, toilet repairs and ensuring water and sanitation facilities. The community was also included in decision making. All community members agreed to resolutions that they will send their children, especially girls, to school. As a result of these collaborative actions, enrollment, attendance and quality of teaching has significantly improved. “CMP’s intervention has ensured community ownership and women’s inclusion in local decision making,” the Head Teacher said. CMP is a USAID-funded program that supports the Government of Sindh’s education reform and USAID’s Sindh Basic Education Program. CMP improves school resources and encourages community support for educational reform in Sindh province while identifying and addressing primary barriers to access, particularly for female students.